Work by Myles Calvert. Calvert’s current work explores the relationships that develop between everyday objects of comfort and popular culture interferences. Influences are heavily drawn from contemporary and modern printmakers such as Richard Hamilton and Paula Rego. Interests lie in the ideals of Romanticism - exploration of unique moments and personal emotion through the use of shape and colour. 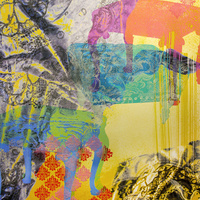 Unique surfaces are explored through print - specifically CMYK rip software (screenprint, photopolymer etching, laser woodblock), halftone structures and manipulations of those patterns / angles to achieve controllable photographic to distorted variants. The digital glitch present through Adobe software programs drives forward the question of technologies place and developing role in traditional processes. In particular, focus has been on melding traditional woodcut with laser woodcut variants, exploring MDF vs, plywood and plexiglass matrices. TroTech and Epilogue lasers offer different focal lenses that achieve a wide spectrum of refinement with unique surfaces. Environmentally friendly substitutes, photopolymer plates, and the 'pushing’ of print possibilities through advancements in other mediums, is a constant drive to produce and exhibit.